Dublin-based medical device company, X-Bolt Orthopaedics, has been granted a US Patent for its novel hip bone fracture device. Its “Alignment Jig for a Bone Fixation Device” is used in the pioneering X-Bolt Hip Nailing system. The US Patent was granted on 16 December 2014 and will remain in force until 27 January 2032. Addressing a real problematic gap in the global hip fracture market, the X-Bolt Hip Nailing system significantly improves the efficiency of current hip fracture treatment and reduces the requirement for very costly and often devastating repeat surgery. The jig is an integral part of the X-Bolt Hip Nailing system and will greatly facilitate surgery and allow for an easier and faster operating time. 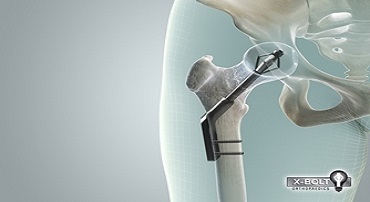 X-Bolt Orthopaedics was established by former orthopaedic surgeon Dr. Brian Thornes in 2007 to develop a unique expanding bolt medical device for hip fracture fixation. The X-Bolt Nailing system utilises the X-Bolt expanding bolt for femoral head fixation, which is common across the company’s hip plating and nailing systems. It gives stronger in-situ hold and rotational stability versus traditional lag screws in hip fracture fixation. Novel and concise instrumentation allows for faster operating time, with less hospital inventory. Stronger fixation reduces complications and average bed stay, thus providing significant savings to hospitals. The novel alignment jig comprises a hollow curved metal portion proximally, which allows a hollow flexible connector drive to pass through, connecting the jig to the nail. Thereafter, within the hollow flexible connector drive, one can pass a flexible screwdriver to deploy a pre-loaded set screw within the intramedullary nail. These steps are all remotely operable from outside the body/operative field. Speaking about the US Patent, Dr Brian Thornes said: “The granting of a US Patent for the X-Bolt Hip Nailing system jig means we can continue to provide additional innovative solutions for orthopaedic surgeons. Being able to operate an instrument outside of the body, around a corner and into the medullary cavity of the femur eliminates a known fiddle-factor issue and speeds up operating time. This novel jig concept is also easily adaptable to other intramedullary nailing systems such as the distal femur, humerus and tibia.” X-Bolt Orthopaedics’ founder, Dr. Brian Thornes, previously invented, developed and licensed the ankle “TightRope” concept and device to Arthrex, Inc (Naples, FL) in 2003.